I almost went to sleep after a few hours in Second Life. I opened Twitter on my compulsive last-minute check (you know you do it too). I'm so glad I did! I am blogging realtime so forgive the updates and typos mess please. Yesterday (Saturday September 17th; Constitution Day) a wildly-guestimated 1000 to 5000 marched on New York City’s Wall Street in a protest loosely organized by Adbusters, the non-profit, anti-consumerist organization, made the first call for an occupation of Wall Street back in July when they posted an article on their website titled, #OCCUPYWALLSTREET.” Anonymous joins Adbusters. Because there's been a major media blackout (see below) hard numbers are hard to come by. The hashtags on Twitter are #TakeWallStreet and #OccupyWallStreet. I've been up all night watching. There's about 300 people sleeping peacefully in the nearby park, holding the protest over til morning. UPDATE: tweets heating up at 7:19amEDT UPDATE: Many more people returning to the park. Much of the protest organization was being directed through Twitter via #OccupyWallStreet, but it was reported that Twitter blocked that particular tag at some point early Saturday morning and #TakeWallStreet jumped up. There are other streams/hashtags going but these are the main ones. UPDATE: also #GeneralAssembly and #usdor UPDATE: Twitter removes #TakeWallStreet from Trending (US) but Spain still shows it. UPDATE: The progression of change #Occupywallstreet so we did then came #TakeWallstreet so we took contoll over night now its #OurWallstreet [9:55amEDT] UPDATE 12:02pmEDT: Hashtags appear to be trending in certain cities and countries but not in others. The "censoring" may be stream being throttled because of immense traffic. UPDATE: Finally, some sense and explanation on #hashtags: a hashtag has to be NEW to be trending. No one is "censoring" anything; the hashtags are aging and falling off the Trending stats. 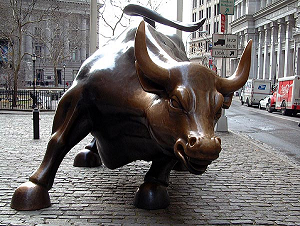 The protestors had planned to rally at the famous Wall Street Bull at 12 noon but police blocked all the streets near the New York Stock Exchange and Federal Hall in Lower Manhattan. UPDATE: several tweets and retweets indicate NYPD is being very well-behaved and not hassling protestors. Right now (6:49amEDT) it appears as if a large-scale media blackout is in progress, at least as far as CNN, Fox and MSNBC are concerned. Al-Jazeera English seems to be the only major media outlet to be covering the protest. There are a few articles on the nets but not from majors like the New York Times. People on Twitter have been calling out to the mainstream media, asking "hey where are you? You cover smaller Tea Party demonstrations, where are you now?" UPDATE: Russia-24 is reporting [you tube]... nothing on any French media... UPDATE 7:26amEDT "there are reports that NYPD are trying to keep (media camera) feed trucks from parking near the protestors to film" UPDATE: 8:24amEDT: still very little major news coverage, US and international. But Twitter and blogs and IRC is going wild. UPDATE: The Australian prints coverage. This post from The Nation's Allison Kilkenny is being passed around a lot. Many people are retweeting "be calm" and "peaceful protest!" to keep solidarity and to be conscious. People are tweeting quotes from Gandhi and King, Jefferson and the Right of Assembly. People were assembling in the nearby Zuccotti Park when it was tweeted that the park's owner said it was fine [Zucotti Park is privately owned by Brookfield Office Properties. NYSE: BPO] As of this writing there are no reports of violence and few (if any) arrests. Many people (including myself) are encouraging people to video, photograph and record this event to both circumvent the media greyout and to use their OWN media to tell their OWN story. UPDATE: crowd is chanting ""It's Just a PRACTICE....It's Just a PRACTICE" UPDATE: people are calling for bread, coffee for the protestors; others are responding and tweeting locations for it. It's been reported Starbucks in NYC is providing free coffee to people who slept on sidewalks to support but this is probably a joke :D UPDATE: there are calls for a "General Assembly meeting" at 10amEDT. UPDATE: actually the Starbucks was for the police! lol. Corporations aren't people. Money isn't speech. [sign at protest] Market forces made me do it. Uninstalling #Wall Street... 5% complete. "The right of the people PEACEABLY to assemble, and to petition the Government for a redress of grievances." I refuse to believe corporations are people until Texas executes one. The police ask to speak to the leader. We told them that there is no leader. They didnt understand. The Revolution may not be televised but it will be tweeted. Just because we can't see it [on major media] doesn't mean it isn't happening. [photo] "I can't afford a lobbyist, I am the 99%"
Americans are having to choose between shelter or groceries. AND MEDICAL treatment. Older woman passing by: "we did it in our time, now it's yours." The corrupt fear us. The honest support us. The heroic join us. Show solidarity for those occupying Wall Street. Close your banking account tomorrow. Put your money in a credit union. "Wikileaks Top Secret Mobile Information Collection Unit truck"
Incredible: "5 Minutes of Slow Motion Video"
12:27amEDT: WHEW! 9+hrs up/watching/tweeting/posting; I need some sleep! But how could I ignore this story when it speaks of everything this blog is about? NET POWER NET POWER NET POWER! 1:28pmEDT: bunch of RTs about "Many hells angels coming down !!! (confirmend on police audio)" probable agitators/disinformationalists. Teabaggers out in force now jamming Twitter channels. Every once in awhile someone will tweet something provacative like "protect yourself from the cops!" but by all reposts, the police have been mostly sympathetic and non-hostile, particularly after Mayor Bloomberg had made his statement.